Recorded in several spellings as shown below, this is an English surname. It is a patronymic of the Middle English word "eme", meaning uncle. It is presumed that the Uncle was originally given to a man who played a paternal role with a young niece or nephew following the death of the father, or otherwise, was used as a term of endearment for a benevolent older man. The surname is first recorded in the latter half of the 13th Century (see below), and r early recordings include John Eame, in the Records of St. Bartholomew's Hospital, London, in 1320, and William Eames at Whitby in Yorkshire, in 1340. The initial "h" was often prefixed to the name in the early 16th Century, as for example Robert Hemes of Suffolk, in 1555. 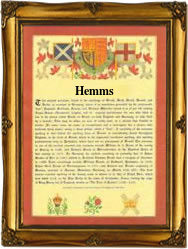 The modern spellings of the name include Eames, Heams, Hemes and Hemms. An interesting namebearer, recorded in the "Dictionary of National Biography", was John Eames, who died in 1744. He was an F.R.S., and a friend of Sir Isaac Newton. He also edited Isaac Watt's "Knowledge of the Heavens and Earth made Easy", in 1726. The first recorded spelling of the family name is shown to be that of Andrew le Em..This was dated 1274, in the Hundred Rolls of Norfolk", during the reign of King Edward 1, known as "The Hammer of the Scots" 1272 - 1307. Surnames became necessary when governments introduced personal taxation. In England this was sometimes known as Poll Tax. Throughout the centuries, surnames in every country have continued to "develop" often leading to astonishing variants of the original spelling.